Backache - GP or Chiropractor - you have options! Backache Solutions: GP or Chiropractor? Chiropractic helped self-employed man return from a backache. A backache: Chiropractor or GP? 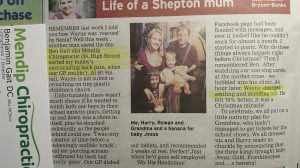 It is an absolute privilege to be able to help someone in difficulty as highlighted in this news clipping from last year. Gradually people are coming to understand the role Chiropractors can play in the healthcare system and especially with symptoms such as a backache. But that does not mean your GP understands or follows the current NICE guidelines. Sadly there is one GP practice in Shepton Mallet that tells their patients not to see a chiropractor! I won’t name names yet although I should because the other practice has been a little more cooperative. We have GP’s and retired GP’s that use our services with satisfaction. Sadly I doubt that the negative influencers have much understanding of what we do. Chiropractors are spinal care specialists. The first visit with us lasts up to an hour. This enables us to take a thorough history, a detailed exam and then offer practical care, with help and advice based on our 5 years of professional, masters-level training, the range of techniques and subsequent experience. We are able to help most people that come to see us directly. We are professional but we recognise that we do not have magic wands. Therefore, if we think there is an injury that needs further investigation we try to our best to refer you on, e.g. into the NHS system for an MRI. The reports we receive from patients who visit a GP instead are a little different – a 10-minute consultation followed by a prescription to mask symptoms is typical. With our approach, we are aiming to help manage the symptoms but also address the underlying dysfunction. I am not writing this to knock the local GP’s one or two cooperate with us. But I want the public to understand their options. Chronic back problems are crippling individuals as well as the system but if people knew where to turn, we could lessen this burden. I have tried at least 4 times to speak to the practice that makes disparaging remarks about Chiropractic, during my years serving in Shepton Mallet. I have written and emailed and called. I never got a reply. A visit to a Chiropractor costs less than a visit to a GP but the GP visit is paid through taxes.